Johannesburg-based Petmin, has operated its Somkhele mine since 2007 just 17km from the border of the Hluhluwe-iMfolozi Wilderness, Africa's oldest formal park, and a haven for white rhino. Since the company's arrival, Petmin has shown a worrying disregard for local communities and ecosystems. In violation of sacred traditional protocol, the company dug up the graves and remains of ancestors to get at the coal. Hundreds of people have been forced to leave their lands and seen their chiefs and traditional healers compromised, allowing the company's operations to pollute water, air and land in the area. The remaining people of Somkhele now receive water once a week from a truck and suffer from respiratory diseases and tuberculosis. Now, just 20km south of Somkhele and a mere 40 metres from the edge of the park, a new coal mine, Ibutho Coal's Fuleni Project, is being planned to access a seam of anthracite. Seeing what has happened to Somkhele, communities who stand to be displaced by this new mine are opposing it. Community activists like Mam Khuluse from Ocilwane are insisting the companies "leave the coal in the hole." Ibutho Coal’s application for an open cast mine threatens the world famous iMfolozi wilderness area, a sanctuary for the greatest concentration of rhino in the world. The mine also threatens the livelihoods, health and well-being of neighbouring rural communities. The proposed mining area is sited on the boundary of the iMfolozi Wilderness Area, the first declared wilderness in Africa. It lies within the oldest proclaimed nature reserve in Africa, the Hluhluwe-Imfolozi Park (HiP) home to a vast array of wildlife, including the Big Five. The Wilderness Area has a strong cultural heritage, dating back to the Stone Age. For the Zulu people, it is an important sacred site since before the time of King Shaka, who grew up in the area. HiP enjoys a reputation as a major tourist attraction and has drawn visitors from all over the world for more than 100 years. This unique wilderness area with such a rich history can never be replaced. Two coal mines already enclose the iMfolozi Park: Zululand Anthracite Colliery (ZAC) owned by Rio Tinto, and the Somkhele mine, operating as Tendele and owned by Petmin. With Ibutho Coal’s application for the Fuleni Anthracite Project , iMfolozi will literally be hemmed in by coal mining operations. Open-cast coal mining requires a substantial amount of water, and inevitably causes widespread air, noise and water pollution, resulting in irreparable environmental damage. The proposed Fuleni coal mine raises the following serious concerns: The draft Environmental Impact Report identifies 16 500 people who would be directly or indirectly affected by negative impacts during the life of the mine. This does not include future generations affected by irreparable damage from the mine. Many families, some child headed, currently living in the seven villages located within the proposed MLA, stand to lose their homes, schools, clinics, water supplies, roads, grazing areas for their cattle and goats, croplands, sacred natural sites, and burial sites. The mine would disrupt the social fabric of the Fuleni people and be a magnet for opportunistic elements, including criminals, who would move into the area resulting in increased levels of crime. Rhino poachers will seize the opportunity to conceal themselves amongst the shifting population, leading to an increase in the slaughter of rhinos for their valuable horns. More than 84 million cubic meters of the ‘greenhouse’ methane (CH4) gas would be released into the atmosphere. Methane is 20 times more powerful than carbon dioxide (CO2) in its affect on climate change. The issue of water for the proposed mine remains unresolved. The Mfolozi River catchment is a highly water stressed area recently in the grip of one of the worst droughts in living memory. It is not an option for the proposed mine to draw water from the Mfolozi River. The sourcing of such a large volume of water, without taking it away from people and their needs, has not been clarified. Pollution of surface and ground water resources is an inevitable consequence of open cast coal mining. Rural people, their livestock and wild animals are dependent on existing water resources. Should these become polluted by acid mine water and toxic heavy metals, there would be significant health impacts for all life, including residents living in the downstream town of Mtubatuba and its environs. Visitors to HiP and other tourism attactions in the area would also be at risk. Large quantities of black coaliferous dust produced by open cast mining activities, coal and discard dumps, and trucking coal long distances by road, pose significant health risks. Prevailing winds carry the dust into human settlement areas (homes, schools, grazing areas, and croplands), the Wilderness area and Hluhluwe iMfolozi Park (HiP) resulting in high levels of toxicity and pollution of water. Coal dust also covers and contaminates vegetation, thereby poisoning food sources for wild animals and livestock. Studies show that dust from the proposed Fuleni mine will blow into the iMfolozi Wilderness Area and HiP at levels that will exceed National Atmospheric Air Quality Standards resulting in a a spoilt and polluted natural environment. The impacts would be devastating to wildlife and to tourism operations. Fuleni residents and animals would be at high risk of developing life threatening respiratory diseases from breathing in and accumulating coaliferous dust in their lungs over time, especially people and animals living in close proximity to the mine. Noise generated by heavy machinery day and day, explosions to blast rock, seismic ground vibration, light pollution that blots out the stars would occur repeatedly and continuously during the life of the mine. This would affect people living near the mine, visitors to HiP, and people going out on Wilderness trails. Severe impacts on elephant, rhino, crocodile populations and birds of prey would also be expected. The iMfolozi Wilderness would be de-designated because of the loss of its wild character and natural environment untransformed by mankind. Wilderness trail guides would lose there jobs because wilderness trails would no longer be undertaken. The conflict is escalating. 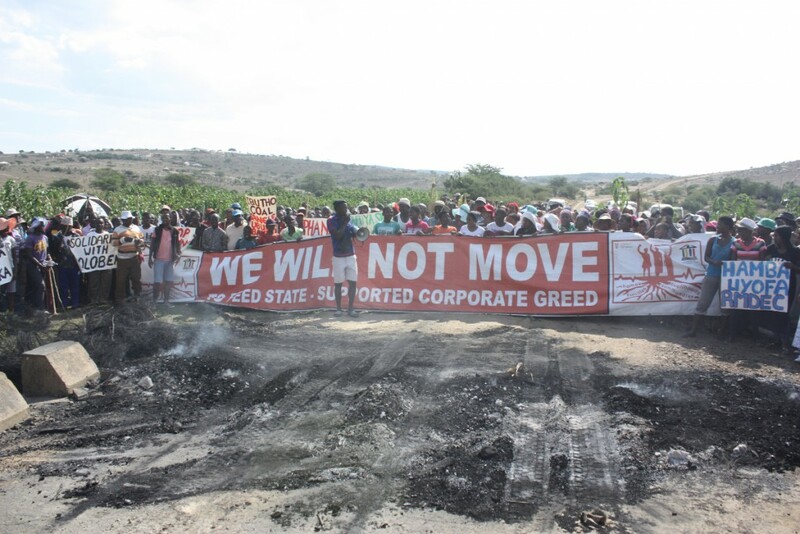 On 22 April 2016 it was reported (by Sheila Berry) that an angry but well-behaved crowd of well over a thousand Fuleni residents forced the Regional Mining Development Environmental Committee (RMDEC) to abort their site visit to Fuleni for Ibutho Coal’s proposed open cast mine on the boundary of the iMfolozi Wilderness Area. In the early hours of the morning, irate Fuleni residents blocked the main road to Ocilwane with rocks and tyres, which they set alight to create a barricade to prevent vehicles entering Fuleni. Ocilwane is the village that will be most affected by the proposed coal mine. The police eventually managed to enlist assistance from march convenor, Phila Ndimande who together with other Mfolozi Community Environmental Justice Organisation (MCEJO) activists and researchers from the Centre for Civil Society (CCS) – UKZN, managed to persuade the local residents to assist with removing the rocks and burning tyres. However, once the road was cleared of obstacles, the people surged on to the road and created a human barricade to prevent vehicles crossing the bridge. They held a big banner that spanned the road saying: WE WILL NOT MOVE. When the RMDEC team arrived, a stand-off ensued but eventually they had to concede defeat and turn around and drive back to Enseleni. In this conflicts there is a confluence of local livelihood interests and defence of indigenous territorial rights with global considerations about climate change (and “unburnable fuels”) together with defence of a wilderness area. In this regard KwaZulu-Natal’s most respected and experienced conservationists have argued that the controversial Fuleni coal mine envisioned to be established right on the boundary of the Wilderness area of the historic iMfolozi Game Reserve will undermine and in some cases destroy the very fabric of managing Protected Areas in KZN, if not South Africa. Oscar Mthimkhulu, manager of the Maloti Drakensberg World Heritage Site and Jabulani Ngubane, manager of Hluhluwe-iMfolozi Park (HiP), expressed their “increasing dismay” at the damage the mine would cause to tourism, wildlife and natural resources alike, as well as devastating the livelihoods of local communities presently living in the path of the mine. Against which there is a coalition of eight NGOs (and numerous international voices) under the banner of ICWA; the iMfolozi Community and Wilderness Alliance. ICWA comprises the active support of the Global Environmental Trust (Get), groundWork, African Conservation Trust, Wessa, the Wildlands Trust, the Wilderness Leadership School, the Magqubu Ntombela Foundation and Mining Affected Communities United in Action. Local environmentalists asserts that there is a local, national and international support base commensurate in voice, passion and capability with all those that fought the St Lucia sand mining proposal back in the 1980s. The difference here is that a huge number of the local Fuleni community are vehemently opposed to it too. We, the members of Mfolozi Community Environmental Justice Organisation (MCEJO) and the Fuleni community wish to bring to your attention that we are fed up with the corruption of the majority of members of the Mhlana Traditional Council and the willingness of the government to sell the Fuleni people's land to Ibutho Coal and its foreign investors while sacrificing the lives, health and livelihoods of the residents of Fuleni, particularly the seven mining affected communities: Ocilwane, Novunula, Fuyeni, Ntuthunga 1 and 2, Emakhwezini, and Shayamoya. Today's demonstration, on 21 April 2016, is also to show RMDEC and DMR that we are totally opposed to Ibutho Coal's proposed Fuleni coal mine on our land. The march is an expression of our frustration at not being consulted and not having our voices heard no matter how loudly and clearly we say “No to mining”. We ask why the government is entertaining Ibutho Coal, a prospecting company, with no proven experience of mining. Also we call on the Ingonyama Trust Board to intervene as the trustees of our tribal land and ensure that the needs and rights of the affected communities are considered and parotected. The demonstration is to make it clear to the corrupt leadership and authorities that enough is enough. Ibutho Coal we do not want to see you back on our land. Mining is not development. No matter how much the government tries to push the lie that mining creates jobs for the local communities or that the people living close to mines benefit., we know otherwise because already we are living close to Tendele's Somkhele coal mine. We know from regular contact with the Somkhele communities and other mining affected communities in Mpumalanga and Limpopo that mining brings death and suffering; steals our agricultural and grazing land; pollutes air and water; poisons the soil; splits communities apart; shatters the peace of rural living with explosions; cracks our houses; breaks our windows; brings suffering to our old people, children and our livestock; and only benefits already wealthy shareholders and directors but leaves local people impoverished. It also If living next to mining is so beneficial, we wonder why rich privileged people do not decide to relocate their homes and families to eMahleni? We are feeling the effects of coal-related climate change and so strongly oppose the continued use and extraction of fossil fuels. The devastating drought here in Fuleni is expected to occur more frequently and become more extreme yet the government is agreeing to thirsty coal mines stealing our water, another constitutional right we are being robbed of. - No corruption of any kind and no intimidation, oppression, harrassment, and disregard for human rights and basic democratic processes, or threats to people's lives will be tolerated. MCEJO, with this memorandum, wants to send a clear message and set our position to claim back what is rightfully ours and to put an end to corruption in Fuleni and any talk of Ibutho Coal and mining. Therefore, we call upon the Minister of Mineral Resources, RMDEC, the MEC for Economic Development, Tourism and Environmental Affairs, and Co-operative Governance and Traditional Affairs to implement the will of MCEJO and the Fuleni people. Why? Explain briefly. There is strong opposition to the Fuleni coal mine both from conservationists and from local communities and EJOs. The company is South African. The amount of coal to be mined (less than one million tons per year) is not huge. The project might be stopped also because low coal prices in 2016.